In case you haven’t heard, smoothie bowls have become all the rage of late. Who would have thought? You make a smoothie, put it in a bowl and add some toppings, and voila! A smoothie bowl! Smoothie bowls make for a great breakfast or lunch. They’re easy to make, portable and offer your body loads of nutrients and an easy to digest meal. There’s also tons of variations you can make, like smoothies, the sky is the limit – or maybe just the rim of your bowl, but you get the idea. I made this papaya smoothie bowl for breakfast in less than 5 minutes. I love papaya, it’s super high in vitamin C and has so many other health benefits. For this smoothie bowl, I topped with some freshly sprouted buckwheat, which does take longer than 5 minutes, (it actually takes at least 1 day). I love sprouted buckwheat, it makes for an amazing alternative to grains. Check out this article on the top 10 reasons buckwheat makes an awesome grain alternative. All you will need for this smoothie bowl recipe is a high-powered blender. I personally use and love my Vitamix. I have the Deluxe Edition and feel like it’s well worth the investment, considering how much I use my Vitamix. 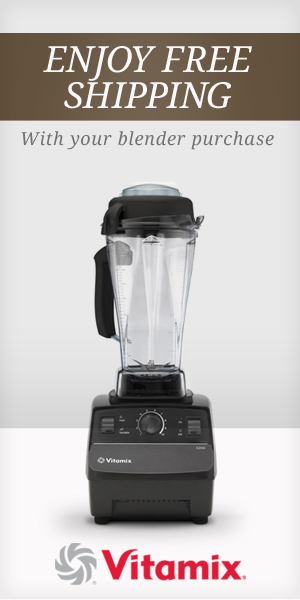 A blender is one of the Top 4 Kitchen Essentials I highly recommend stocking your kitchen with. Optional: 1 teaspoon of turmeric powder. We grow a ton of turmeric on our land here in Hawaii, and I try to eat it as much as possible, considering all of turmerics amazing health benefits. We’ve been drying our own turmeric powder (which has been very exciting!) but this is an optional ingredient in this papaya pie smoothie bowl recipe. It’s the cinnamon and vanilla with the sweetness of the dates, banana and papaya that makes this smoothie bowl recipe taste like pie – pretty epic! You can top this smoothie bowl with whatever toppings you prefer, (like raisins, granola, fruits) but I personally love to top it with sprouted buckwheat. It’s really east to sprout buckwheat. If you haven’t seen any of my sprouted buckwheat granola recipes, check out my raw pecan granola recipe here or my raw goji berry granola here. When you wake up, rinse it in a strainer very well until the water is no longer slimy (which is normal). Leave it in a strainer over a bowl or over the sink for the day, covering it with a clean dish cloth (but not touching the buckwheat). Rinse again at night and let it sit in the strainer over night, covered. Rinse one more time in the morning. At this point you should see a little “tail” growing on the buckwheat. You could keep sprouting it for another day if you want to, but it’s totally ready to eat now. Once you’ve used what you like for the meal, place the rest in a sealed container in the fridge, and it will last for at least 4-6 days. Live Free, Laura D. Author of Mindful Eating for Dummies as well as Unhooked: A Holistic Approach to Ending Your Struggle with Food.